Kidney stones are chemical crystal masses that develop in concentrated urine and may move into the urinary track where they cause a significant amount of pain. Many stones resolve themselves while others can be treated medically with non-invasive procedures and medications. A kidney stone is a mass of chemical crystals that forms in the kidney, ureter or bladder of an individual. Such stones may develop to different sizes and in different shapes, from tiny microscopic crystals to quite large stones. Kidney stones can occur at any age but are far more prevalent between the ages of 20 to 40. It is during this time that most patients develop their first stone. A person who previously had a kidney stone has an almost 50% chance of developing another one, especially within ten years. One in every 20 women might develop a stone while three in every 20 men might. The kidneys are the body’s filter for the blood, cleaning it of impurities. They work to remove waste chemicals and excess water from the blood and the body. This process produces urine. The ureter is a tube that carries urine from the kidneys to the bladder which works as a storage reservoir. When the bladder is full, urine flows out of the body through the urethra. Waste chemicals that have been flushed out by the kidneys dissolve in the urine. However, sometimes the chemicals form tiny crystals which clump together in the urine to form a small mass known as a kidney stone. Kidney stones that develop and remain in the kidneys cause no symptoms and produce no physical problems. Individuals may not even be aware that they have one. Stones have a greater chance of being produced when a person’s urine is concentrated. Concentration occurs when someone exercises vigorously, lives in a hot environment, or works in a hot environment. These situations create conditions in which the individual loses more fluid through sweat than through urine, greatly concentrating the remaining urine. Some medical conditions may also cause kidney stones, but this is far less common. Individuals with a family history of kidney stones are more prone to developing them than others. 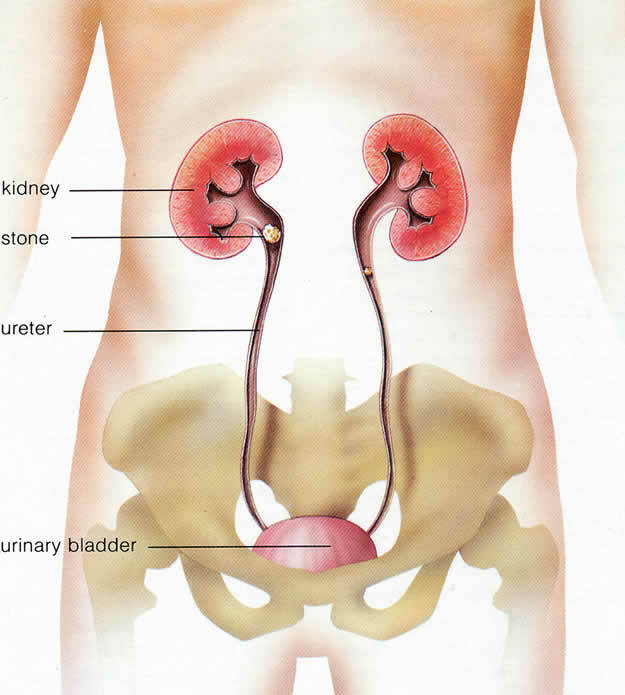 When kidney stones are present, a person may experience one or more symptoms, including significant pain (felt in the side and lower abdomen), renal colic (pain that peaks and ebbs, caused by the contraction of the ureter trying to move a blocked stone through the urinary tract), the urge to urinate more frequently, pain when urinating, and blood in the urine. In more severe cases, the blockage leads to an infection which brings on a fever. Drinking plenty of water to increase urine flow in order to pass the stone out of the body is usually the first course of treatment. The medications Nifedipine or Tamsulosin can be prescribed to help pass stones. Large stones that become stuck in the ureter can cause extreme pain and other symptoms requiring admission to the hospital. To prevent the reoccurrence of kidney stones, it is important to drink plenty of fluids daily to keep the urine dilute and prevent stones from forming. When the chemical composition of the stone is known, a dietician can recommend dietary changes to prevent the buildup of offending chemicals. Uric stones can be prevented with certain medications. Contact us now at the Radiation Oncology Center in Florida.